 Mouse anti human CD99 antibody, clone DN16 recognizes human CD99, also known as E2 antigen, MIC2 or 12E7. CD99 is a 185 amino acid ~32 kDa single pass type I transmembrane O-glycosylated glycoprotein. Three isoforms can be producted by alternative splicing. Epitope analysis of the DN16 clone suggests the antibody recognizes a minimal peptide sequence "LPDNENKK" located between residues 32 and 39 towards the N-terminal region of the molecule. This sequence is present in both isoforms I and II but is largely absent from isoform 3 suggesting that the antibody will only recognize isoforms I and II (Gil et al. 2002). CD99 expression is notable in the testis, pancreas, bone marrow, lymph nodes and spleen. CD99 is expressed on all classes of leukocytes and tends to be highest on immature cells. Functionally CD99 has been found to be involved in cellular adhesion/aggregation (Krisanaprakornkit et al. 2013) and apoptosis (Sciandra et al. 2014). Choi, E.Y. et al. (1998) Engagement of CD99 induces up-regulation of TCR and MHC class I and II molecules on the surface of human thymocytes. J Immunol. 161 (2): 749-54. Hahn, J.H. et al. (1997) CD99 (MIC2) regulates the LFA-1/ICAM-1-mediated adhesion of lymphocytes, and its gene encodes both positive and negative regulators of cellular adhesion. J Immunol. 159 (5): 2250-8. Kim, S.H. et al. (1998) Generation of cells with Hodgkin's and Reed-Sternberg phenotype through downregulation of CD99 (Mic2). Gil, M.C. et al. (2002) Characterization and epitope mapping of two monoclonal antibodies against human CD99. Exp Mol Med. 34: 411-8. Kim, S.H. et al. (2008) Viral latent membrane protein 1 (LMP-1)-induced CD99 down-regulation in B cells leads to the generation of cells with Hodgkin's and Reed-Sternberg phenotype. Husak, Z. et al. (2010) Death induction by CD99 ligation in TEL/AML1-positive acute lymphoblastic leukemia and normal B cell precursors. J Leukoc Biol. 88: 405-12. Husak, Z. and Dworzak, M.N. (2012) CD99 ligation upregulates HSP70 on acute lymphoblastic leukemia cells and concomitantly increases NK cytotoxicity. Cell Death Dis. 3: e425.